Depleting resources. Volatile prices. Intensifying competition. World economic uncertainty. Rising costs. Changing government policies. There are numerous opportunities and pitfalls for energy and mining companies – how they are tackled will determine future success. We know this because we are there, helping our clients meet – and profit from – the challenges they face. The Moore Stephens Energy & Mining team provides a full range of services to a wide variety of businesses operating in natural resources, oil trading and renewable energy. We provide clients with the advice and support required to tackle compliance, improve performance, address risks in uncertain times and access capital markets when possible. We have earned a respected profile in the energy and mining sector and developed strong relationships with other professionals, enabling us to connect clients with the right people at the right time. As one of the few ‘mid-tier’ accountants specialising in the energy and mining sector, Moore Stephens provides a real alternative to the larger firms. Vasily Nikitin, Head of the Energy & Natural Resources Group, has extensive industry expertise and his audit practice covers the largest Kazakhstan companies such as Kazakhmys (mining), MangystauMunaiGaz (oil and gas), TurgaiPetroleum (oil and gas), KazGerMunai (oil and gas), KuatAmlonMunai (oil and gas), PNPZ JSC (oil refining factory). 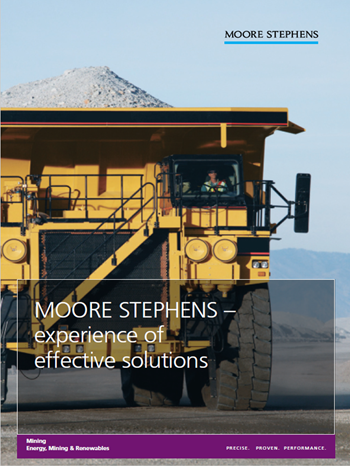 At Moore Stephens, we recognise the many challenges faced by businesses focused on the mining of coal, gold, iron ore and other natural resources. Fluctuating commodity prices and currency values add greater complexity to the process of planning future operations. Persistently rising operating costs, not least through wage inflation in many regions, have increased pressure on margins and the need for efficiencies. Additional challenges arise in relation to completing capital projects, many mining companies failing to do so on time and on budget. We offer expertise in financial accounting and reporting, audit and assurance. In providing our services we draw on the Moore Stephens International network of member firms, with sector and technical experts based in all key mining regions: Africa, Russia and the CIS states, Canada, Asia (including Indonesia and Malaysia) and South America. Close working with our London office ensures a smooth, one-stop service for all our mining clients. Ever-increasing global demand for energy. Volatile markets. Calls for reduced greenhouse gas emissions. Evolving political and regulatory priorities. Emerging new technologies. Increasing cost pressures. Aging workforce. It’s clear that energy companies are facing one of their most challenging times. For many of these organizations, a key to adapting will be finding an informed perspective that can help them position themselves for what the future may bring. Our Energy professionals combine real-world industry experience with an in-depth understanding of our clients, their businesses, and the issues they face. We are constantly looking for better practices and emerging technologies. This helps us provide a highly informed perspective, which can translate into high-quality service. Our practice assists major organizations in the industry such as Ekibastuz GRES-1 (transfer to IFRS, compilation of financial statements) and Shardara Hydro Power Plant (audit), Astana Water Supply. We understand the complex issues this sector faces; the key industry drivers; technical operating processes; and regulatory considerations that apply to this market.